Photo by Pam In Pacifics. This member of the Cucurbitaceae family was given this name by John Kunkel Small in1903. It is found in open areas of Mexico and south western U.S.A., growing in a well drained soil with little to some water and some to lots of sun. 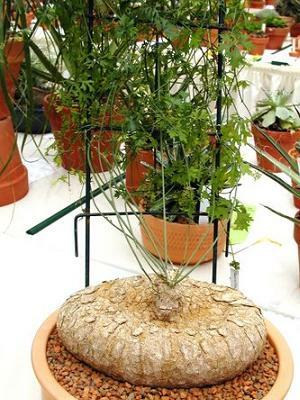 The caudex can grow to 35 centimetres in diameter, the vines will crawl along the ground for three meters. The flowers are yellow with a dash of green. Ibervillea is dioecious, there are separate male and female plants.